Fascinating and mesmerizing. 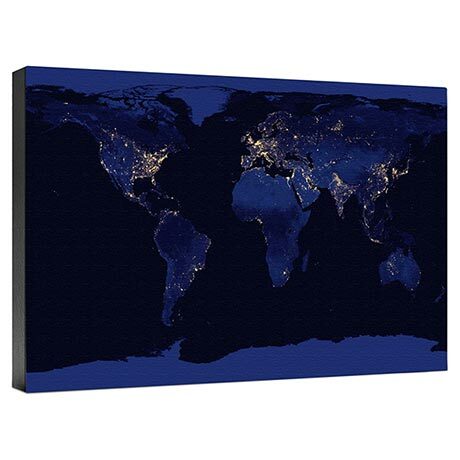 This unique perspective of the Earth at night was created by using data acquired over nine days in April and October 2012, by the Suomi NPP Satellite. 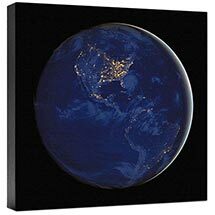 It took 312 orbits to capture clear shots of the entire planet and construct this composite image of our world. The brighter the lights, the more heavily populated the area. Giclee printed with UV resistant inks on linen canvas and gallery wrapped on 2" wood stretcher bars, ready to hang. Made in USA. Allow 2-3 weeks. No gift box or rush delivery. Item can only be shipped within the Continental US.